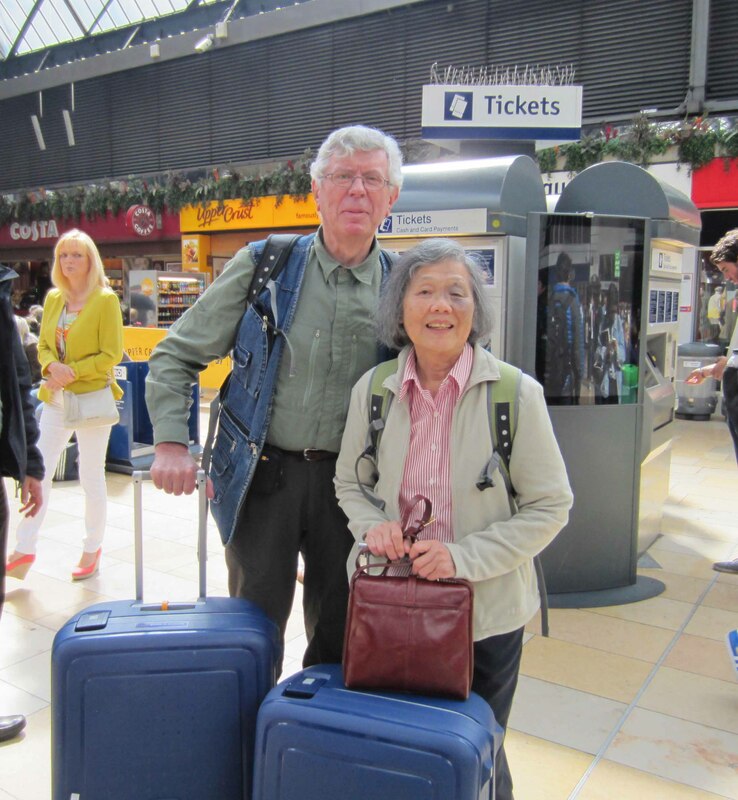 We rolled our suitcases into the street from Glasgow’s Carlton George Hotel and pulled them around the corner to the Queen Street railway station. A noticeboard apologised for disruptions to train services but our train for Ardlui on the banks of Loch Lomond left exactly on time. After emerging from a tunnel it cut between lush banks of shrubbery punctuated with brick walls. We saw flashes of Glasgow’s suburbs: naked rows of unlovely tenement strips coated in grey stucco. Grey is a pretty popular colour in the suburbs of Glasgow. Worry on the left, bright optimism on the right… at Glasgow Queen Street station about to board the train for Ardlui. The weather was warm with sunlight oozing slowly from a sleepy, cloud covered sky. The views folded out into flat vistas of parks and suburbia and eventually to bright green farmland sloping gently into the Clyde River. The track rose into hills, stands of Scottish fir trees appeared framing picturesque glimpses of water below seen through racing green lace-works of leaves. An hour into the trip and we were edging into a highland landscape. Rugged, steep, stony cliffs loomed. Several bare, grass-covered pyramid peaks marched past above us, and below fingers of water pointed the way into the interior. An overcast sky began to press down. As the train slid into Ardlui station after an hour of scenic magnificence heavy rain began to fall and the temperature dropped. We had arrived in the Scottish highlands, and the region was determined not to betray its reputation for gloomy weather. Ardlui is small, scarcely more than a hamlet, but in summer holiday-makers jam its cramped caravan park and camping ground. Bumping on jet-skis or pulled along on water skis they buzz back and forth across Loch Lomond, cutting white scars into the lake as they swerve around yachts and launches idling in the water. Above them the quiet hills rise steep and bright green into the grey sky. On the morning of Tuesday July 30th we started walking the West Highland Way. It was a reassuring start. A ten minute launch ride took us across the loch to a small, spindly steel jetty a hundred metres from the Way that had already wriggled up to Loch Lomond from the suburbs of Glasgow. “The West Highland Way” is much too grand a name for the foot wide, rock-strewn trail of mud that snaked away before us up into the hills. Our walking poles came out immediately and stayed gripped in our fists for the next five hours. We levered ourselves up through gauntlets of bracken, peering over it at views down Loch Lomond. Again and again we were stopped in our tracks by the vast splendour around us. At the start of the walk: a narrow trail through a vast green landscape. The going was tough, especially for me. I was not in top shape. Emmy was better prepared and often walked a hundred metres ahead while I puffed and stumbled and found excuses to stop. There were quite a few stiles to cross too. I discovered that age had taken away from me the confident, leg-swinging straddling of stiles and had turned each crossing into a wobbling exercise in keeping balance. We negotiated at least thirty mini-quagmires of mud, rocks and water that days of rain had laid down along the track. Two hours into the walk, and still not halfway to Crianlarich, I was aching and struggling. I struggle through a “cow creep” between Ardlui and Crianlarich. There is something unexpectedly good about walking in remote places. You can’t wimp out. There are no bus stops or taxi stands. There are no snack bars or coffee shops. There are no seats or shelters. No mobile phone connection either. And you’re pretty much on your own (we met only a few fellow walkers who whizzed past us with annoying cheerfulness). So there are no options. You have to plough on into your pain and keep putting foot before foot. It hurts, but because you have to do it you discover that you can do it. 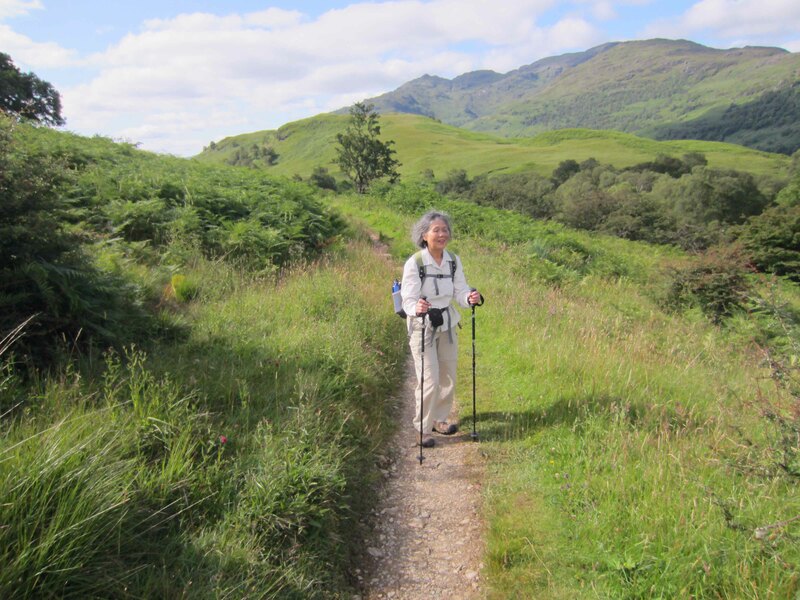 The walk from Ardlui to Crianlarich is not long, about fourteen kilometres. But it is rough, and it took five hours of pain to deliver us to our destination. As we trudged into the centre of the village looking for our accommodation at the Crianlarich Hotel exhaustion tricked me into making a right turn instead of a left turn. We walked to the edge of the village before I realised the mistake. So we had to walk back, adding more than a kilometre to the burning ache under our feet. A hot shower and an hour’s deep sleep only partly revived me. At 7.00 pm we hobbled grimacing into the hotel dining room. On the walls above the dark wainscoting the remains of meals past looked down – stuffed stags heads and assorted animal skulls, around a dozen of them, were staring down at diners. A waiter with the bullish dimensions of a rugby player greeted us at the door. “How are we this evening?” he roared in a broad Scottish accent. He leaned towards me and lowered his voice. This did not bode well for the evening’s meal. But I needn’t have worried. In the kitchen a hard-working squad of cooks from Romania and Hungary, who clearly were glad not to be somewhere else, were cooking up a storm. 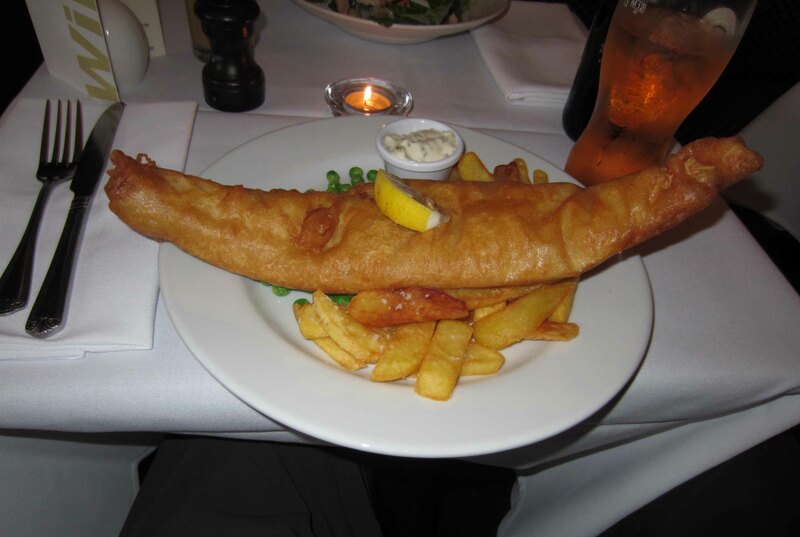 When my order of fish and chips arrived I had to look at it, then look up at the waiter, then back at the plate before me, then back at the waiter again. His smirk said “Yes sir, it is your order”. On the jumbo size plate lay an enormous crescent moon of fish, its two cusps easily jutting beyond the edges of the dish. Under it lay a bed of flat cut, deliciously crisp-looking potato chips lightly sprinkled with grains of rock salt. Healthy, sweet-looking green peas were in attendance too, not to mention what looked like home-made tartare dressing and a juicy wedge of lemon. For a weary walker it was a vision from heaven. Glancing up at the glassy eyes and antlers and skulls above me, I wolfed it down. Delicious… the best fish and chips I have ever eaten. 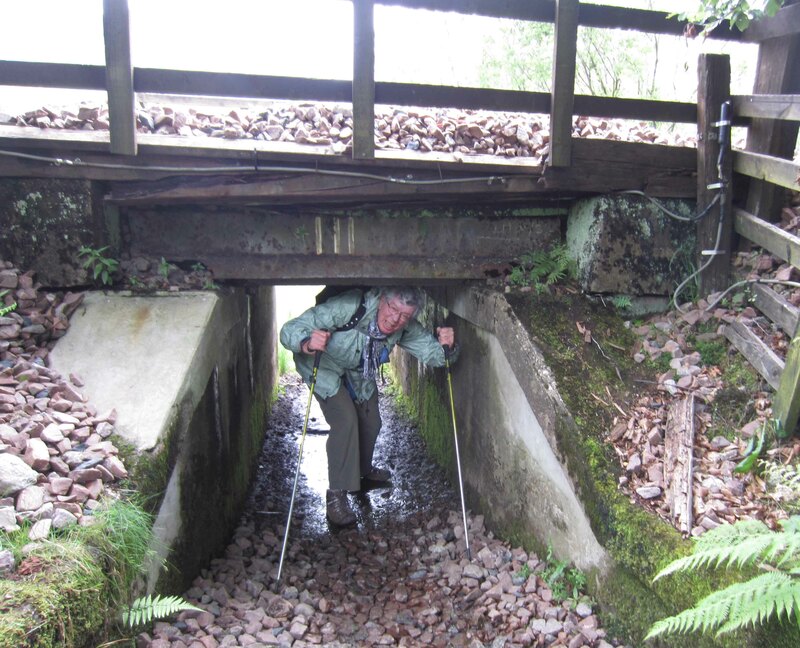 After getting hammered on the fourteen kilometre walk from Ardlui to Crianlarich I was dreading the next leg – a twenty-one kilometre slog mostly through forest country to Bridge of Orchy (pronounced /OR.key/). The day dawned cool and overcast with rain clouds scudding from horizon to horizon. For the first few kilometres we weaved through a dripping forest of Scottish fir trees. The path was wet and slippery after overnight rain, and very stony. As always in Britain the forest was wrapped in total silence. We knifed through banks of thick moss and soft green hooks of wet bracken massed at the path side. In the distance steep hills appeared and disappeared behind cowls of misty cloud. We couldn’t do more than creep forward, jamming our walking poles into the mud and sucking our boots up with each step. Intense weariness clambered aboard and my steps became more and more laboured. At one o’clock, four hours into the walk, we were approaching the village of Tyndrum, still thirteen kilometres from Bridge of Orchy. It didn’t look good. But the weather saved us. As we plodded into Tyndrum rain began to bucket down, fine but heavy. Tyndrum has two railways stations, a lower station for trains to Oban, and an upper station for trains to Fort William. And the Fort William line passes through Bridge of Orchy. It was a no-brainer. Bent under the downpour we walked as quickly as we could up the hill to the tiny station. Yes, the next train did stop at Bridge of Orchy and it would come by in one hour. Perfect. We sat on the deserted platform munching apples and watching the rain-hooded ghosts of Tyndrum’s hills. Tyndrum to Bridge of Orchy takes just fifteen minutes by train. We enjoyed every second of the warm, dry carriage. It was raining hard in Bridge of Orchy too, but I had a spring in my step as we headed down the hill towards the hubbub of the bar in the Bridge of Orchy Hotel. 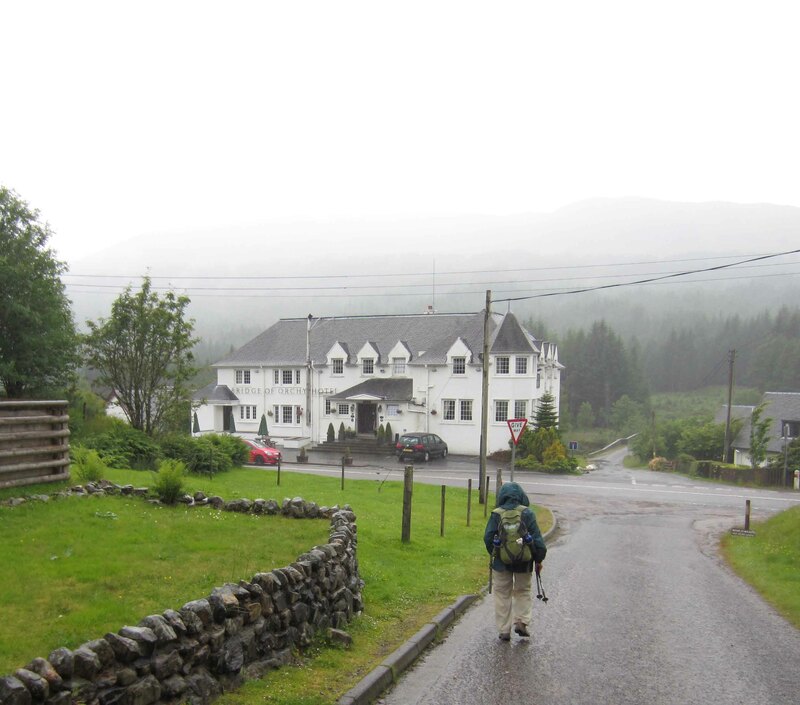 Arrival at the Bridge of Orchy Hotel. Warmth, dryness and a bottle of cider beckon. Wow… Krishna, you did more than Emmy and I are doing. We are doing a “rail and hike” package, so we are walking only about half the GHW. But next week we will be starting the Great Glen Way from Fort William up Loch Ness to Inverness and there will be no compromise on that one… walking all the way! Yes, be great to catch up and talk walking. BTW, it is still raining fairly steadily here in Fort William. And it is rather cold too. What a relief to come to the happy end !